Shame on Our Lady of the Rosary Catholic Church in Little Italy. San Diego, California devout Catholic and local businessman John Sanfilippo died last week from complications due to emphysema. Sanfilippo, who left a large sum in his will to his church, had made arrangements for his funeral to be held at Our Lady of the Rosary Catholic Church in Little Italy, where he had attended for decades. This weekend Sanfilippo’s partner of 28 years and his family were informed by the church that they had cancelled his funeral service because he was gay. No uncertain terms or minced words here – Just straight up because he was gay. This is only the second incident ever of a Catholic church refusing to hold a previously planned funeral for a homosexual parishioner in our country. 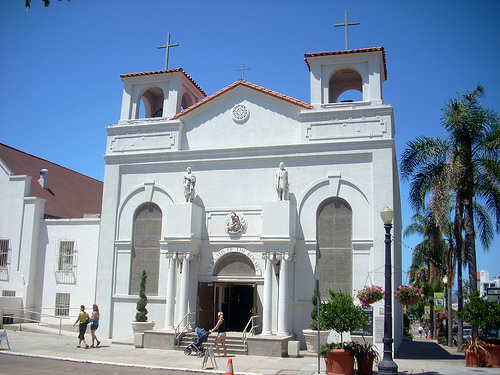 The first, the funeral of John McCusker in 2005, also occurred in the Roman Catholic Diocese of San Diego. When this deplorable tale of denying a mourning family a planned mass for a deceased loved one became national news, the church began singing a different tune. At the cocktail lounge that Sanfilippo owned for 28 years came outrage from friends over what some called a confusing statement from the San Diego diocese. “All of a sudden, they change their mind and say, ‘Well, you know, we may still allow the funeral to be here.’ Why? Because they got caught in the process of denying equal rights to people?” asked Neil Thomas, a friend and customer of Sanfilippo’s. Cannon also believes the statement is unclear. “I think it’s confusing… They did their best to put the verbiage in there that they needed because they still have their… out,” he said. Ramirez said the statement was proof the parish was acting alone and the diocese needs a diocese-wide policy so a similar situation does not happen again. But after a hurtful rejection, it appears Sanfilippo’s family has moved on. “From what I’m told, they don’t want it there now,” said Thomas. Ramirez said Sanfilippo’s family had already found another Catholic church for the funeral. Ramirez said the family would not feel comfortable going back to Our Lady of the Rosary after what happened. No one from Our Lady of the Rosary was available for comment. Absolutely horrible. The Roman Catholic Diocese of San Diego and Our Lady of the Rosary Catholic Church in Little Italy should be absolutely ashamed of themselves. As should legislators who continue to provide religious institutions with exemptions from the law, leaving them free to practice hateful discrimination exactly like this. Our condolences go out to John Sanfilippo’s partner, family, friends and loved ones.